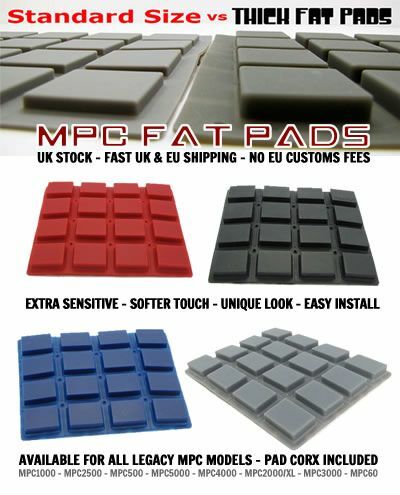 MPC Fat Pads - Fast UK/EU Shipping, No EU Customs Fees! I currently have a limited number of MPC Fat Pads available for shipping directly from the UK. These are official MPCStuff.com stock, brand new and sealed; I’m currently the only official UK/EU distributor for these products. If shipped to the UK or an EU country there will be no VAT, customs charges nor import duties to pay. Shipping is quick, with UK orders dispatched via Royal Mail first class (1-2 days) and EU orders sent via International Standard (3-5 days). All pads come supplied with ‘pad corx’ to increase sensitivity. To order, please contact me or send me a Private Message. Re: MPC Fat Pads - Fast UK/EU Shipping, No EU Customs Fees! How about pads for the Ren, will they be available, too, sometime? And I have seen a Ren dust cover on MPC-Stuff.com I am interested in. Could you provide that as well? I might get some Ren/Studio pads in the next shipment, no plans for any other parts ATM. RecordsManipulate wrote: ARe they still available? Yes, currently have red and blue in stock for the 1000, I've sent you a private message with more details. I ordered a set of thick pads from mpc-tutor and I got them quickly, installed and mpc is now much more fun to use! Many thanks to Andy for all the support! Yes I have fat pads for the MPC2500 in red, dark blue and black, corx included. £36.99 inc shipping to the UK, royal mail first class signed for. PM me for more info. Andy was rapid in getting back to me and I ordered the pads yesterday...arrived this morning! Quick easy install and well, WELL worth the outlay. Miles better than the stock pads.